It's been quite a while since I have posted anything to this blog. That's partially the fault of the old guy to the right. No, not me, but the other old guy in the picture. 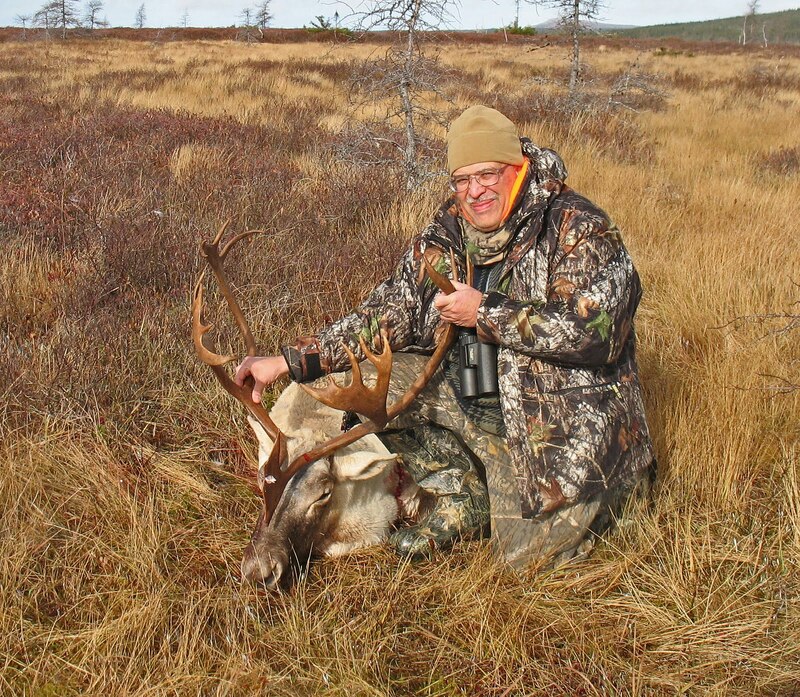 I spent the last week of October in Newfoundland on a Caribou hunt planned two years ago. When I returned, there was an end-of-year panic at work to get deliverables (and billings) out of the door. So essentially until the week of Christmas I had little time for the railroad. And that was unfortunate because in early October I had committed to holding an open house for the Baltimore/DC O Scale group on Jan. 8. I deliberately committed to hosting because I wanted to use it to force myself to push construction work ahead on the layout. As luck would have it, my plans did not work out as well as I had hoped. Now I was behind the "8 - Ball"; I had prefabbed some new sections of benchwork, but they had yet to be erected. I ordered flex track and roadbed and cleared my calender for the last two weeks of the year for some serious construction. 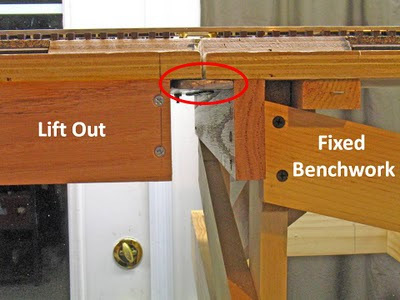 You may have noticed on the video, the benchwork steps down as it approaches the basement walkout door. Partially this was to accommodate the light switch that you see in the final frame and partially this was to match the benchwork height on the other side of the door. 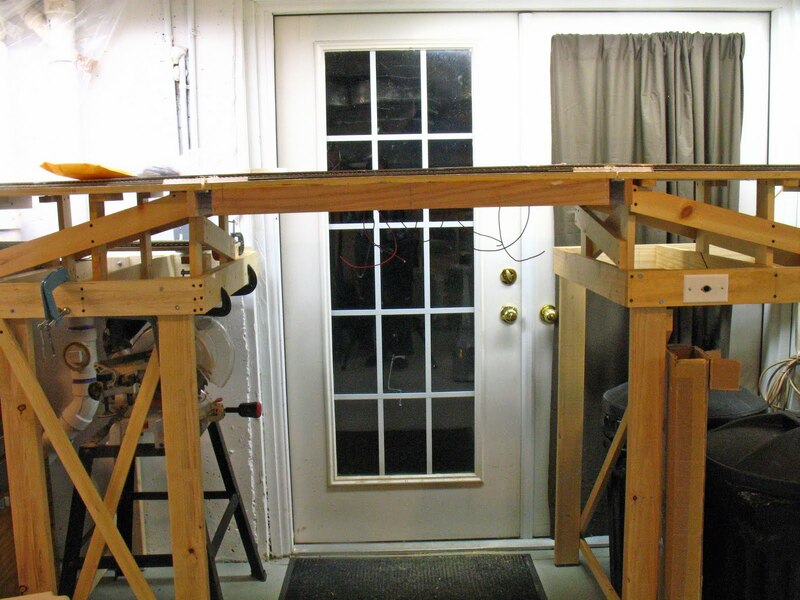 What about the walkout basement door? My initial plan was to give the railroad the right-of-way and block the door. As time went on, I rethought that plan and decided that it would be better not to block the door. The gap in the benchwork for the door is the clear section between the green and the yellow on the diagram above (not drawn to scale). How to bridge the gap was the problem. Swing-out, lift-up, drop-down and lift-out sections were all possibilities. I opted for a lift-out section, based on the perception of simplicity. The gap at door is about 40"; I spanned the gap with a 2' x 8' piece of 3/4" plywood set on the subroadbed risers. The plywood extended a little over two feet on either side of the gap. Although this is on the Cranberry Grade and is running 2% here, this section was set level as I did not want the rail gaps either side of the lift-out to be on a grade - too many chances for a derailment. For a similar reason, the track on the lift-out and for 17" either side of it is straight. I did not want the trucks to hit the gaps while going through any curve. Why 17"? That's the truck center-to-center spacing of an 85' O Scale passenger car, so my longest cars should be heading straight going into the lift-out. Even though this was 3/4" ply, I was concerned about sagging of the lift-out, especially over time. So I built a frame out of 1"x3" red oak under the removable part of the lift-out. 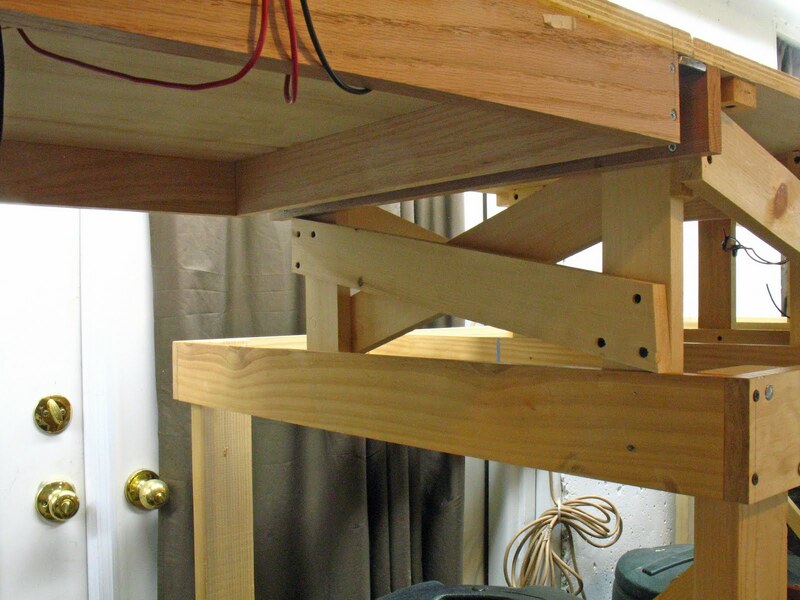 In addition, I reinforced the 3/4" ply either side of the lift out with the same 1"x3" red oak. 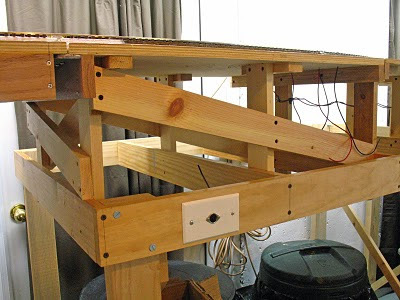 The reinforcement makes the lift-out heavier than it would otherwise be, but the structural integrity is worth it. The location of the ledge is highlighted by the red ellipse. You may be able to see that the edge of the ledge has been rounded so that it will not catch anyone walking through the opening. After the ledges were in place and secured to the fixed benchwork, I set my circular saw for a 3/4" deep cut and cut through the plywood deck to free the lift-out. The lift-out section was able to be removed and replaced easily and accurately. Which implied that the ends of the fixed benchwork had not moved; but the real test will come if it's still accurate after several seasonal changes in weather. Now was the time for laying track. 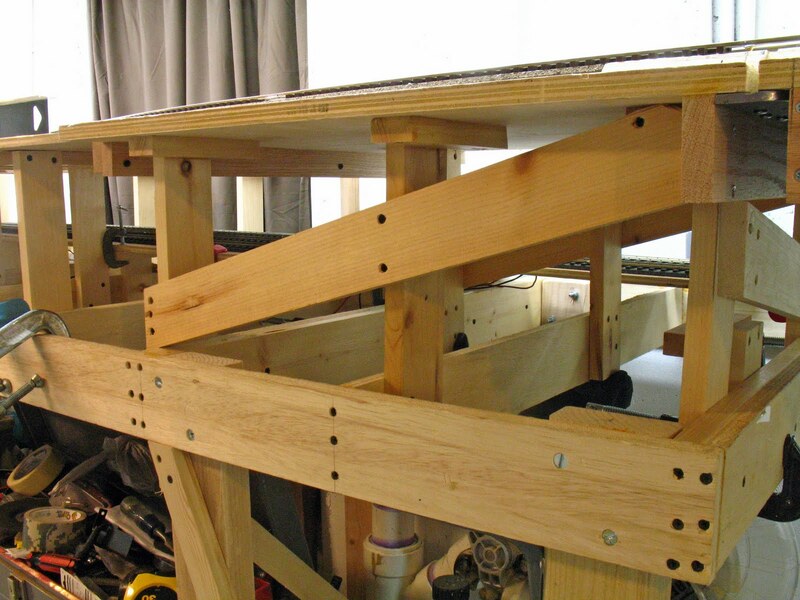 I've seen movable sections where the roadbed and flextrack was laid directly on the plywood top. This did not seem to be sufficiently rigid in that the track and roadbed could be moved very easily or even expand/contract over time resulting in a misalignment of the track. I'm an engineer and very much a belt and suspenders type of guy so I wanted to come up with a better way to fix the ends of the track. You can see my solution in the following picture. 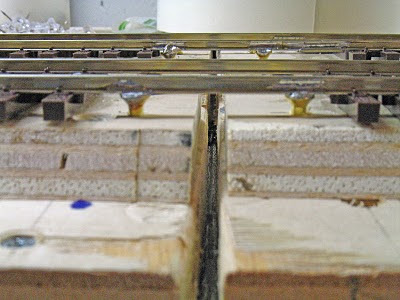 I made anchor blocks out of 1/2" plywood, beveled on the sides for the ballast profile, which are placed either side of the rail gaps where they are secured with glue and screws. The flextrack is secured to these blocks with adhesive and brads. 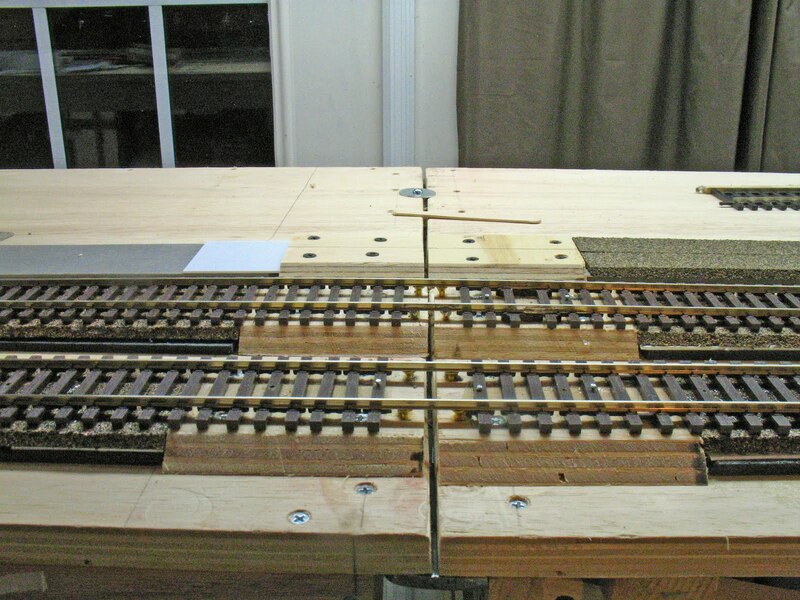 The scheme that I came up with to keep the ends of the rail in alignment can be seen in the following photo. I put brass screws under the rail before the track was laid. These screws were adjusted to just touch the bottom of the rail. 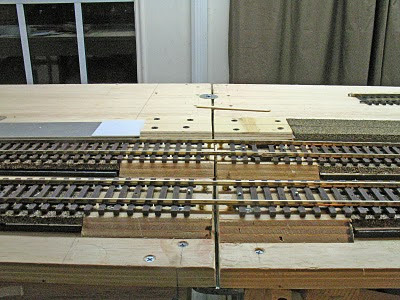 After the track was laid I soldered the rail to the screws to prevent the rail ends from moving. Only two of the three tracks that cross the lift-out will be in place before the open house. Nor will I cut through the rail until the third track is laid after the open house. 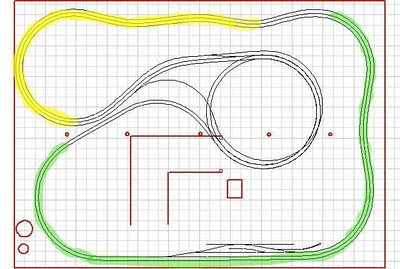 Then I'll know if all of the preparation that I made to keep the track in alignment has worked. It took three days of my two weeks before the open house to finish the lift-out, much more than I had anticipated.